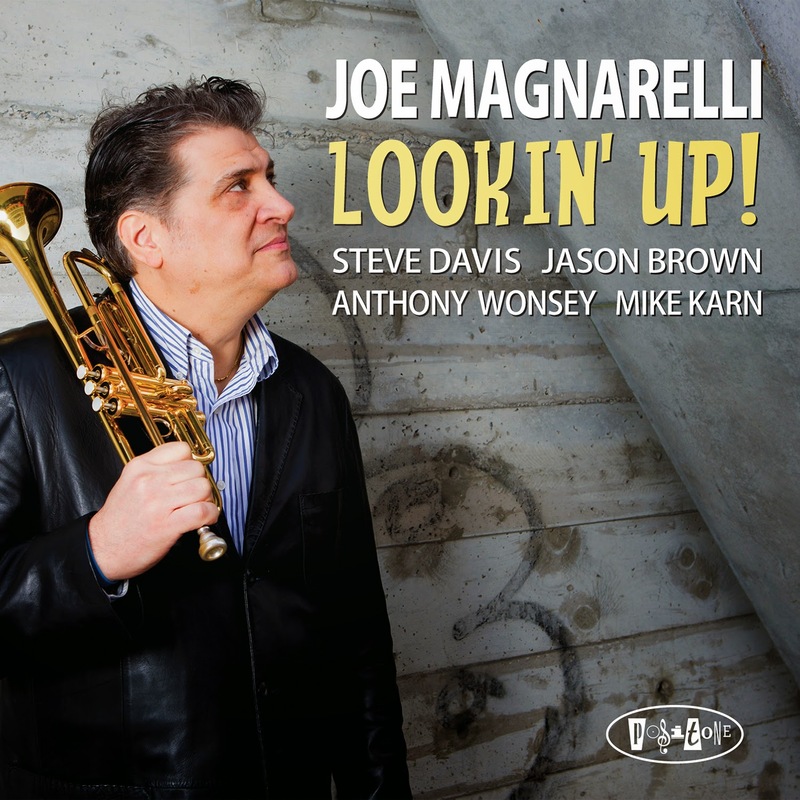 It's been 20 years since trumpeter Joe Magnarelli released his debut on the Criss Cross label. In 1994, "Mags" was already an established voice on the music scene having worked with the Glenn Miller Orchestra, Brother Jack McDuff and Lionel Hampton. Since then, he has worked with a plethora of groups and artists, from the Vanguard Orchestra to Harry Connick Jr. to Jane Monheit to the Lincoln Center Orchestra. His 10th CD as a leader, "Lookin' Up", is his debut for Posi-Tone Records and is a highly attractive session from beginning to end. With the rhythm section of bassist Mike Karn (Vanguard Jazz Orchestra, Harold Mabern) and drummer Jason Brown (Wayne Escoffery, David Hazeltine) plus the articulate pianist Anthony Wonsey, Magnarelli (who plays his mellow flugelhorn on several cuts) weaves his way through a 10-song program evenly split between originals and standards. The flugelhorn makes an appearance on the lovely original ballad, "Inner Beauty." Magnarelli weaves the melody and solo around the delicate piano chords and Karn's intelligent counterpoint while Brown's brushes sweep the piece along. Wonsey's introduction to Jimmy Van Heusen's "Darn That Dream" opens with a slight flourish before he states the melody and sets the stage for the leader to come in on flugelhorn and repeats the melody. The rhythm section tiptoes in at the close of the second verse while Magnarelli repeats the melody once more before taking a well-fashioned solo. "Lookin' Up" breaks no new ground, all the while showing the listener how 5 musicians can have fun in the studio while making meaningful music. Each player contributes to the overall excellence of the performances with a special tip of the hat to the active and engaged rhythm section (including Anthony Wonsey.) Joe Magnarelli's move to Posi-Tone Records makes great sense - this is a label keeping the spirit of hard-bop alive and well into the 21s Century (while not ignoring newer developments). To learn more about the leader, go to www.joemagnarelli.com. To find out more about this and other Posi-Tone releases, go to www.posi-tone.com. Over the past 2 decades, Israel, for all of its political and social issues, has produced a number of impressive musicians, some of whom are making quite an impression on the international scene. Trumpeter/composer Itamar Borochov, raised in Jaffa, the port city out of which the modern metropolis of Tel Aviv took shape, moved to New York City in 2006 to study at the New School. He took instruction from the likes of Junior Mance, Cecil Bridgewater and Joe Chambers. He has since toured and recorded with Aaron Goldberg, Candido Camero, Curtis Fuller and fellow Israeli Omer Avital. In May of 2011, Borochov gathered his Quartet - older brother Avri (bass), Hagai Amir (alto saxophone), and Aviv Cohen (drums) - to record its debut CD in Tel Aviv's DB Studios. The results, "Outset" (Real Bird Records), show a group steeped in the traditions of 1950 and 60s American jazz, especially the sounds of the Miles Davis Quintet pre-"In A Silent Way." With the exception of the handsome ballad "Boston Love Affair" (4:50) and the dark, rubato, "Opening" (1:46 - with a cantorial quality to the low trumpet tones), the tracks are over 8 minutes with three of the seven over 10. The extended length gives the pieces time to develop and allows for the soloists to take their time. "Pain Song" opens the disk, its languid yet hypnotic rhythm suggesting late-60s Herbie Hancock, has a quiet melody played only by the trumpet. Saxophonist Amir enters on the second chorus, playing harmony on the Hebraic sounding melody. The trumpeter builds his solo patiently, like a lament until his phrases grow longer and more agitated, spurring Cohen to loosen up. As Amir reenters, the trumpeter fades out and the pace slows but soon begins to ramp up once more on the strength of the interactions. "Samsara" is much faster, lighter, reminiscent of the Clifford Brown-Max Roach Quintet, especially in the driving rhythms and speedy walking bass lines. The leader again shows his more melodic side until the fire beneath spurs him to greater heights. Amir's solo is bluesy, showing the influence of Julian "Cannonball" Adderley and he plays with great abandon. Avri leads the group in on the Middle-Eastern flavored "Bgida" (translates to treason); the piece displays the darkness of the opening track and brother Itamar's solo is understated even as the tempo doubles near the close of the piece. "Ovadia" also has a Middle-Eastern flavor but a more sensuous feel, with the rhythm section taking the spotlight and being the sparkplug for a splendid alto solo.